La Ferme is comprised of 8 en-suite bedrooms, with a further 3 in the adjoining apartment. The bedrooms are exceptionally spacious and designed in a fusion of contemporary and antique styles. Our spacious honeymoon suite with bay windows and stunning views of the Pleney mountain. It has an open plan en-suite with a free standing slipper bath and twin sinks. Sleeps 2/3. One of the largest rooms in the chalet with a king size double bed and single bed. The en-suite has a bath and shower. It also has a balcony that leads out to the large terrace. Sleeps 3/4. 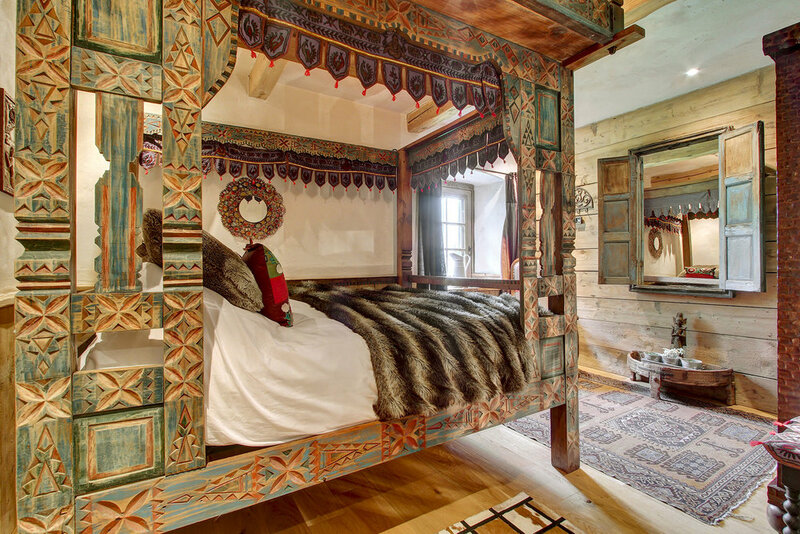 Features a beautiful four poster Indonesian bed and Buddha theme. The en-suite has a bath and shower. Sleeps 2. Fondulay has a double bed and en-suite Italian style wet room. It has a balcony overlooking Fondulay mountain. Sleeps 2. Mont Chery Mont Chery is a charming twin room which overlooks the old Mazot. The en-suite has a bath and shower. The balcony leads out to the terrace. Sleeps 2/3. Ardent is located on the top floor. It has an inbuilt king size double bed and two large antique single beds. The en-suite has a bath. The veluxe and large windows overlook Nantaux mountain. Sleeps 4/5. Nantaux is a large bright room with a double and single bed. The en-suite has a bath and shower. The balcony provides great views of the Nantaux mountain. Sleeps 3/4. Cote D’Abroz is a twin room with two antique single beds. The large en-suite has a shower. Sleeps 2/3.